When you cold call B2C prospects at home to make sales appointments you have to quickly grab their attention, otherwise they will give you some poor made up excuse to end the call. A B2C direct sales prospect doesn’t want to be disturbed at home. They’ve been out at work all day. They now want to relax and see the time at home as theirs and they don’t it invading by sales cold calls. Your sales appointment cold call has to sound more important to the prospect than what they are doing when you phone them. If it doesn’t you won’t get past the opening introduction. Direct sales people want to learn how to put sales training into action to create an effective reason for calling that will grab the attention of the majority of the prospects they call. In the Introduction stage of your sales appointment cold call B2C you will have a reason why you are calling. I’ve said this next line many times and I’ll repeat it again: The reason for calling is the most important line of your sales appointment call script. If you don’t grab the prospect’s attention at the start of the call you will not get past the Introduction and you will not get a chance to gain agreement to a meeting with them. So how do you create a reason for calling that will work for you? 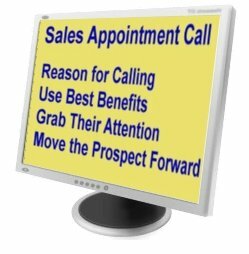 When you cold call B2C prospects to make sales appointments you should use benefits to catch their attention. The benefit gives them a reason to listen to you, a motivator to give you just that little bit more time to put your story to them. 1. You need a benefit with enough strength that it will make direct sales prospects at home turn their attention away from what they were doing and focus it on the potential benefit they could gain by listening to you. 2. The benefit you use must have a wide enough appeal to be relevant to the majority of the B2C prospects that you cold call. If a sales person phones me up and says they want to meet with me to show me a new product that can increase typing speed for non touch typing people that work from a home office and spend 3 hours or more per day typing, they have got my attention. That reason for calling is relevant to me and I will listen. It meets the criterion of statement No1 above. But does it meet the requirements of No2? Probably not, unless the sales person making the B2C cold calls has a list of prospects to call that is so specific the majority of people on it can’t touch type, spend 3 hours plus a day typing, and work from home. You can see how you have to get the balance right so the benefit that you use in your reason for calling is strong enough to grab a prospect’s attention, but also relevant to the majority of people on your B2C cold calling list.